Lavender oil for anxiety is a drug-free way to help with it without the scary adverse effects and withdrawals from anti-anxiety medications. It has such a calming smell, in my opinion. It is one of the most popular aromatherapy oils. Did you know that this essential oil can also help with pain perception? If you have anxiety and have never tried it, I encourage you to do so. You can use it in a diffuser or spray or just put a drop on a corner of your pillow at night. Buy the pure essential oil from doTERRA, not a cheaper, adulterated or contaminated form. When you purchase from doTERRA, not only are you getting extensively-tested (including 3rd-party tested) pure oils that are free from adulteration and contaminents, but you are contributing to sustainability and worker welfare. Lavender essential oil from doTERRA is in my diffuser nearly every night. 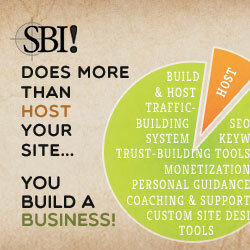 You can read more about why I chose doTERRA here. There have been many studies documenting the anti-anxiety effects of inhaled lavender. 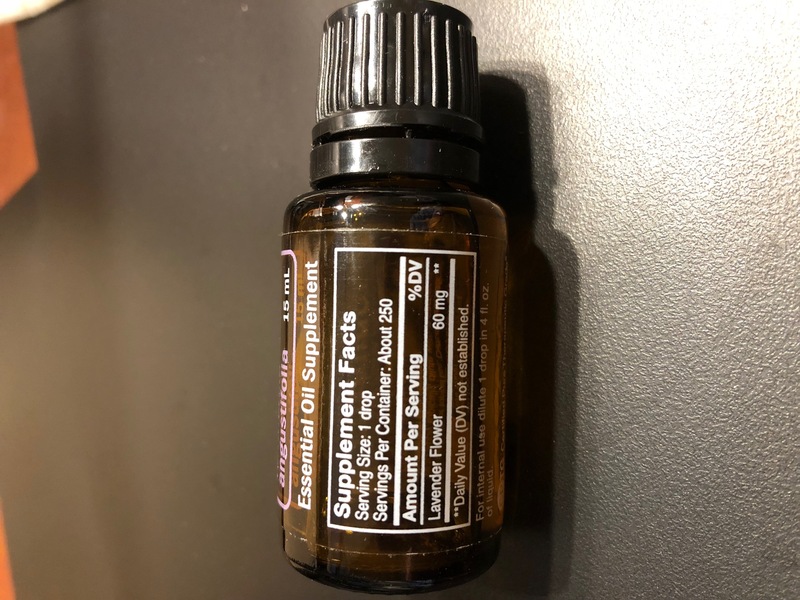 For example, in a study published October 23, 2018 in the journal Frontiers in Behavorial Neuroscience, mice inhaled linalool, one of the main constituents in the oil. The results showed that the smell of linalool triggered GABA-A receptors and a calming effect without any motor impairment commonly seen with benzodiazepines. According to a review in the July, 2017 Mental Health Clinician, the 2 primary terpenoid constituents of lavender essential oil, linalool and linalyl acetate, may produce an anxiolytic effect in combination via inhibition of voltage-gated calcium channels, reduction of 5HT1A receptor activity, and increased parasympathetic tone. A June, 2017 investigation by Milanos et al. published in the journal Frontiers in Chemistry concluded that linalool affected GABA-A receptors more than its metabolites. This study also referenced two prior studies demonstrating the ability of lavender constituents to improve sleep in elderly people and infants. (Hudson, 1996; Field et al., 2008). Unlike purified synthetic linalool used like a drug, lavender essential oil has other compounds which enhance its performance. And, it smells amazing! Lavender oil aromatherapy is also helpful for pain. A study in 30 healthy volunteers divided into two groups who agreed to needle insertion (believe it or not) confirmed this. The stress level, bispectral index value (BIS - a measure of sedation), and pain perception were the same before aromatherapy in both groups. However, after 5 minutes with an oxygen mask coated with lavender oil, the experimental group experienced significantly reduced stress, BIS, and pain values compared to the control group that only received oxygen for the same amount of time. The smell of lavender oil can help with pain. The benefits of smelling lavender oil for anxiety are well-documented, but how about taking it internally? Studies now show that it is very useful for anxiety when taken internally in a food-grade form. The oil MUST be food-grade, and with doTERRA, a nutrition facts label is on the bottle of lavender oil so that you know it can be taken internally. What Does Research Show for Lavender Oil for Anxiety? Lavender oil for anxiety has proven effective. Generalized anxiety disorder (GAD) affects a substantial part of Western societies. It is usually diagnosed by Diagnostic and Statistical Manual of Mental Disorders (DSM-5) criteria used by psychiatrists and by the Hamilton Anxiety Rating Scale. The form of food-grade lavender oil used in GAD studies is called “Silexan”. Silexan is a defined preparation from Lavandula angustifolia derived from the fresh flowering tops of the plant by steam distillation. The main constituents of the product are linalool and linalyl acetate, which account for about 70% of the ingredients. The lavender oil in doTERRA's essential oil and Serenity Restful Complex Softgels has the main constitutents of linalool and linalyl acetate, also. In a 2014 double-blind, placebo-controlled randomized clinical trial in Germany involving 539 women and men with GAD, participants received either 80 mg or 160 mg of Lavandula angustifolia in Silexan or 20 mg of paroxetine or placebo for ten weeks. Paroxetine is an SSRI (selective-serotonin reuptake inhibitor) that is used as an antidepressant to treat depression, obsessive-compulsive disorder, and anxiety disorders, among others. The brand name is Paxil. The measured outcomes were results on the Hamilton Anxiety Rating Scale (HAM-A). In the Silexan 160 mg/day group 60.3% of patients showed a HAM-A total score reduction greater than or equal to 50% of the baseline value and 46.3% had a total score <10 points at treatment end. In the Silexan 80 mg/day group, 51.9% of patients showed a HAM-A total score reduction greater than or equal to 50% of the baseline value and 33.3% had a total score <10 points at treatment end. In the paroxetine group, 43.2% showed a HAM-A total score reduction greater than or equal to 50% and 34.1% had a total score <10 points at treatment end. The placebo group had values of 37.8% and 29.6% for the total score reduction greater than or equal to 50% and for the total score less than 10 points at treatment end, respectively. Participants started with a HAM-A score of at least 18. Results showed that the HAM-A total score DECREASED by 14.1±9.3 in the 160 mg Silexan group, 12.8±8.6 in the 80 mg Silexan group, 11.3±8.0 for the paroxetine and 9.5±9.0 placebo group respectively. Silexan at the 80 mg dosage per day has better efficacy than paroxetine or placebo. Higher dose Silexan 160 mg per day has better efficacy and tolerability yet than paroxetine, placebo, or lower dose lavender. More people responded to Silexan at either dose than responded to paroxetine or placebo. More people were in remission at the end of ten weeks after the 160 mg dose of Silexan than from the 80 mg dose of Silexan, paroxetine 20 mg, or placebo. Side effects in the Silexan groups were uncommon and included gastrointestinal effects at 4.4% in the 160 mg group and 4.5% in the 80 mg group. A higher percentage, 8%, of the paroxetine group had GI effects. The researchers stated that it appeared that the lavender oil, like the established anxiolytic (anti-anxiety) pregabalin (in Lyrica), works by decreasing the release of various excitatory neurotransmitters such as glutamate, but in ways different from pregabalin. Because of this, it is possible that this oil can be used in conjunction with other anti-anxiety medications, but please speak with your doctor. 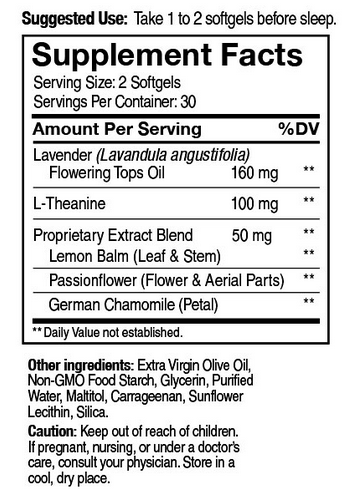 Furthermore, the oil from lavender oil does not work by inhibiting serotonin reuptake, nor did it have clinically relevant inhibitory or inducing effects on several liver enzymes, so it is possible that lavender oil can be used with SSRI or natural serotonin modulating substances without contraindication. Again, speak with your doctor. One thing to be noted is that although 20 mg of paroxetine is the standard dosage, some people need higher amounts and this study did not compare different dosages of paroxetine to Silexan. In this study, Silexan also had better effects on depression scores than either paroxetine or placebo, but since depression was not the primary measured outcome, specific results cannot be assumed. In a September, 2018 review of Silexan by Kasper et al. published in the the World Journal of Biological Psychiatry of 7 cinical trials, five of which had a treatment duration of 6 or 10 weeks, the conclusion was that Silexan was a safe and effective treatment in anxiety disorders. In patients with non-panic anxiety or GAD, the anxiety-relieving effect of Silexan was evident after 2 weeks. There were no major adverse effects and no drug interactions, sedation or withdrawal symptoms at daily doses of 80 or 160 mg. Additionally, Silexan had beneficial effects on typical symptoms that accompany anxiety disorders, such as impaired sleep, generalized aches and pains, co-morbid depression and decreased quality of life. Some people experienced mild gastrointestinal symptoms. Summarizing the results: Lavender oil for anxiety is effective! Do not discontinue any medications without consulting your doctor first. Lavender oil for anxiety does not have scary side effects nor withdrawal symptoms. Withdrawal from anti-anxiety medications, however, is a real concern. People on Silexan did not appear to have withdrawal problems. Researchers stated that people who do not get benefit from 80 mg per day of lavender may increase to 160 mg per day. 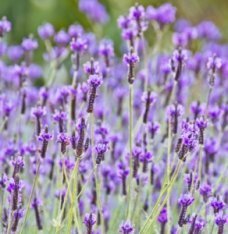 Where Can You Find Lavender Oil for Anxiety? For relaxation and anxiety support, pure lavender oil is available as an essential oil from doTERRA for diffusing, for topical use, and for internal use. Each drop contains 60 mg. Note the Nutrition Facts label telling you that it is food-grade. Do not use other oils. 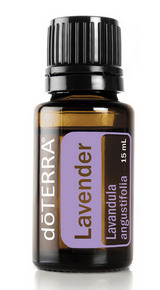 The same pure lavender oil is also available in an easy-to-use roll-on, Lavender Touch. The ingredients are simple: fractionated coconut oil and lavender flower/leaf essential oil. You absorb the essential oil through your skin into your circulation. Topical use is also beneficial to calm insect bites and skin irritations. Histamine released from mast cells is involved in many allergic and inflammatory reactions in the body, and animal research shows that lavender essential oil inhibits histamine release by mast cells. 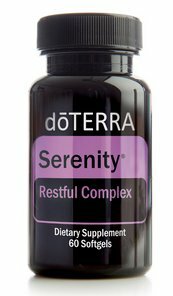 The same pure lavender oil, combined with L-theanine, lemon balm, passionflower and German chamomile for synergistic sleep support, is available in doTERRA's Serenity Restful Complex Softgels. Each softgel contains 80 mg of lavender oil so that you can dose one or two, depending on your needs. There was a study that showed that Serenity was effective in improving several subjective sleep parameters in people with mild to moderate insomnia. Note that carrageenan is no longer an ingredient in this supplement. Is Lavender Oil for Anxiety Safe? Oxidation products of linalool may be skin sensitizing. Give lavender oil for anxiety symptoms a try! Pure lavender essential oil may affect your gut microbiota in positive ways, but that is a topic for another page.